Feather Blade S is Auldey's metal rim yo-yo. 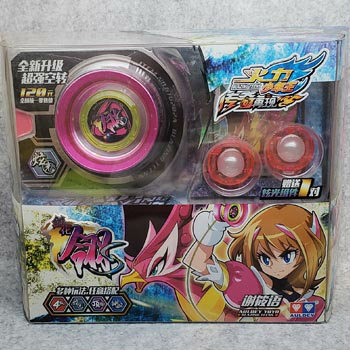 The original name is "Jianhua Rin S"
This yoyo was lineup in BLAZING TEENS season 5. The previous model is "Feather Blade / Jianhua Rin" It's body is plastic. Body material is polycarbonate, rim is aluminum, response is Auldey original pad. This set includes LED unit, character card, string, and Auldey catalog. LED unit is detachable. And this unit can install some other Auldey yo-yo.